What to Tackle With This 2,000 PSI Ryobi Washer? Ryobi Tools is a company that prides itself in the field of outdoor power tools manufacturing. The company takes part in producing and innovating electric and gas-powered pressure washers for light and medium cleaning tasks. We will focus on a residential electric pressure washer model, and try to get its specifications closer to you, as well as its performance. We hope you will find this unbiased and professional Ryobi RY141900 review helpful and useful. This particular model from Ryobi is powered by a powerful 13-amp electric motor. Like mentioned in its user manual, the motor and the pump can produce up to 2,000 PSI of force, at 1.2 gallons per minute, which is considered a mid to heavy-duty pressure washing. The total cleaning power of this unit is 2400. This model is tested on multiple surfaces and we challenged it with several types of stains. When it comes to design, it can clearly be seen that Ryobi is a power tool manufacturer. With its simple, yet slightly industrial features and modern color, Ryobi stands out from the competition. This model is mounted on two wheels, making it quite a mobile pressure washer. It only weighs around 32 pounds. The electric motor, together with the hose reel, is placed in a steel frame (which also serves as a convenient handle to carry it around). Bellow the handle is a compartment for the additional nozzles. Ryobi includes an additional three nozzles with this model: 15-degree, Soap, and Turbo nozzle which delivers a powerful stream of pressurized water. The soap quick-connect nozzle combined with the soap tank made a powerful impact on dirty windows and cars. 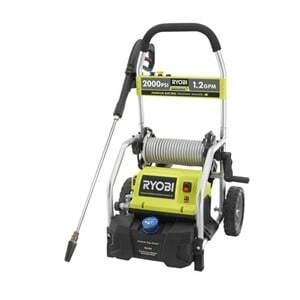 It’s easy to get around the yard with this pressure washer when you are equipped with a 25-feet high-pressure, non-marring hose, that is easily packed onto the hose reel (when not in use), and a 35-feet long power cord. The generated pressure is enough to challenge all the given tasks, but this model excelled in cleaning glass, wood and driveway concrete floor. The turbo nozzle proved to be quite useful for various surfaces. Just don`t forget to keep in mind that you don’t always have to use it because these washers can damage fragile and breakable surfaces with their pressure output. Additionally, you can only use the hose reel when the washer is not in use, meaning that you will need to get the whole hose out before the cleaning starts. A really good thing regarding the Ryobi brand is its community. The company made a platform for power tool enthusiasts called the Ryobi Nation. This particular platform rallies pros and amateurs to share their experience and useful tips about using the tools, and providing help with house projects. When it comes to warranty, Ryobi provides a 3-year warranty `for guaranteed success`, and what makes things even better for the buyer, they provide a 30-day no-risk guaranty for a `worry-free purchase`. Even though it is considered a medium-duty pressure washer, it was able to tackle some of the nastiest stains with success. It is best used on wood, marble, glass, patio and garden furniture. You can clean moss, grime, dirt and dust, grills and other greasy equipment. Just don`t forget to be careful around more sensitive surfaces, because they can be damaged by this pressure washer. And, of course, if needed, the soap can be utilized to wash your car, bicycle and/or other recreational equipment. Especially if it was left out and targeted by birds. This model is quite portable and comfortable to use, which makes it a good companion for longer cleaning sessions around the yard. The housing is durable and protects the electric motor. Also, the price-to-power ratio is pretty solid. Being an electric-powered medium-duty pressure washer, this Ryobi cannot clean old and stubborn stains that are not easily reached, so close-range cleaning is recommended. The fairest answer would be: it depends on your needs. But this far-reaching pressure washer turned out to be quite solid in every occasion and problem presented upon it. The results were consistent and every job was done with relative ease. The medium-duty tasks were also conquered, but they took a little bit more time and persistence. This unit is able to help you with every around-the-house job and project, and the community that Ryobi keeps active is there to give you new ideas on how to utilize it. Especially if you are a DIY-er. So, there you have it, we have presented everything you need in a complete Ryobi RY141900 review, including all information to help you make an informed decision and get rid of those nasty stains.